Nordic Bulkers AB (Sweden) is one of the most important clients of Swagemakers Intermodaal Transport BV. 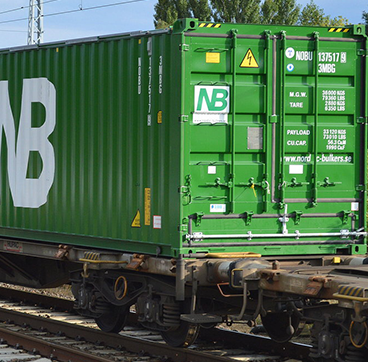 The company is leading in Scandinavia in the area of bulk transport and does so with their own fleet of specially designed 20’, 30’ and 40’ containers for the transport of dry and fluid bulk goods. 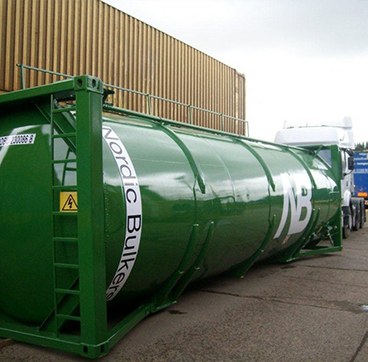 Nordic Bulkers AB specialises in national and international transport, storage, handling and other logistic service for dry and fluid bulk products. Jonny Carlred: “The majority of our clients can be found in the petro-chemical industry”. Nordic Bulkers has more than 2,000 bulk containers that are utilised for the transport between countries in Western-Europe. Terminals for storage, handling and distribution of bulk and packaged products are located in Wallhamn and Oxelosund. In Solna there is a Business Area for industrial products and foodstuffs. Swagemakers Intermodaal Transport BV has been working for Nordic Bulkers for more than 20 years in the Benelux, the Ruhr area and Northern-France. A large number of 30 ft and 40 ft containers are used for granulates and more for clients such as Dow and Borealis. Jonny Carlred: “Nordic Bulkers started working in the mid-nineties with Swagemakers Intermodaal Transport BV for our client Dow Chemicals and we continue to do so today. They load and unload containers and do other sorts of logistical work for us. However, the company has grown and we now also work with them in other logistic terrains.